Jagruti's Cooking Odyssey: Eggless Oat, Red Pepper, Coriander and Pine Nut Biscotti - Countdown to Christmas! 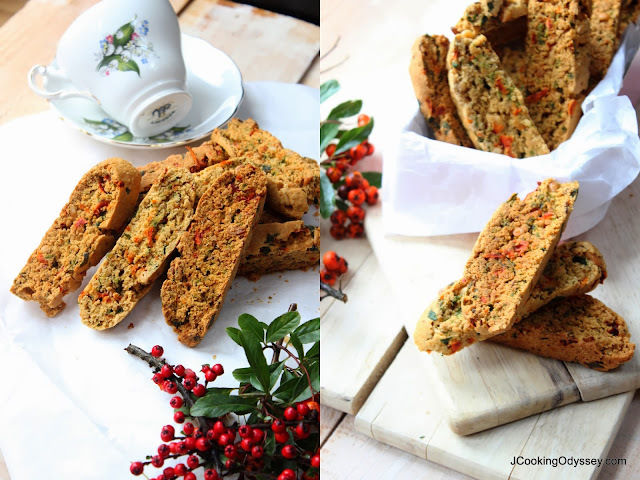 Eggless Oat, Red Pepper, Coriander and Pine Nut Biscotti - Countdown to Christmas! There is an electric atmosphere in and around London these days, likely to be because of Christmas. Surroundings seems to be at their best. Currently London is not at its warmest, lightest or sunniest but you can bet it is at its brightest ! Dull and wet weather, grey skies and early darkness maybe dampen your moods, but a day out in London will certainly cheer you up. Get into the Christmas spirit and enjoy London, every street is glowing with the seasonal decorations and lights. Witness and soak in the breadth, taking in the world famous shopper's paradise, Regent street's Christmas lights, and start shopping for friends and family as you get into the festive spirit. While I am talking about shops in London and Christmas decorations how can I miss mentioning Harrods, the spectacular light display on the outside takes you to wonderland ! Along with brimming Christmas decorations, ice skate rinks, Christmas fun fair and carnivals, Christmas markets are in full swing and are not to be missed. For foodies like me it is the best place to visit, find unusual gifts, join in with singing or enjoy listening to carols and sample traditional treats such as mince pies ! All this fun and excitement I am only witnessing since I arrived here, Christmas was a totally different affair in India while I was a kid. Only Christmas experience I had was one day off from school or sometimes in a Hindi movie you see what Santa looks like and baking was alien to us! While we are talking about baking, my next recipe seems fit for my topic today. 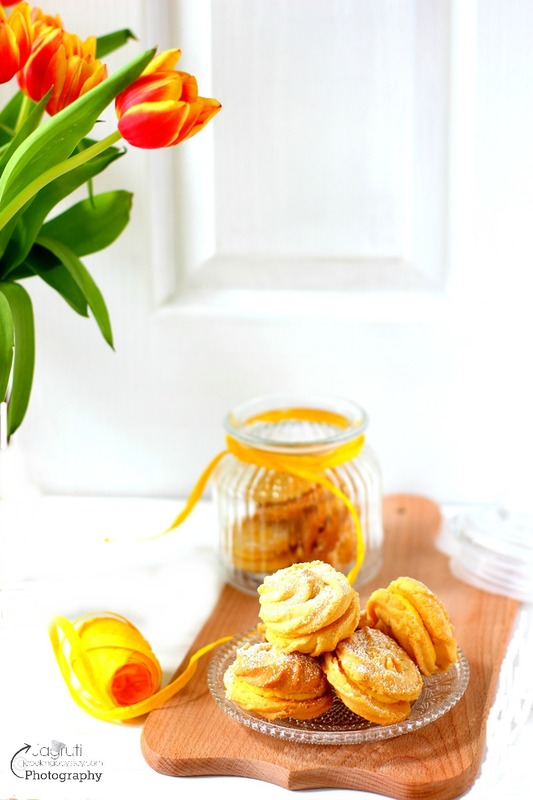 As we are getting into the festive spirit, baking has taken a place in each every household. 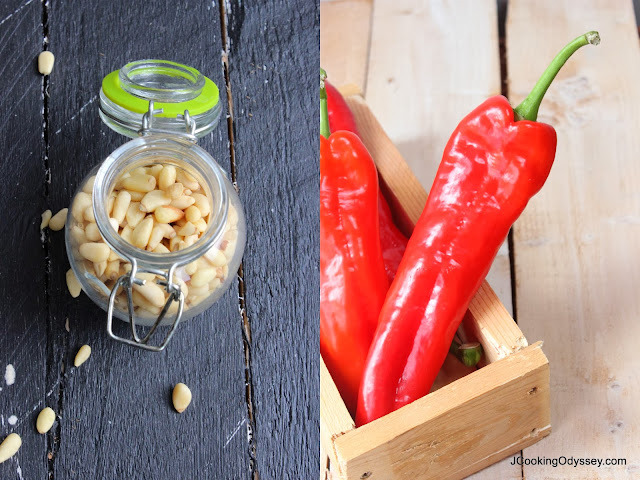 Kids at home, popping into kitchens every two-three hours looking for something to munch. 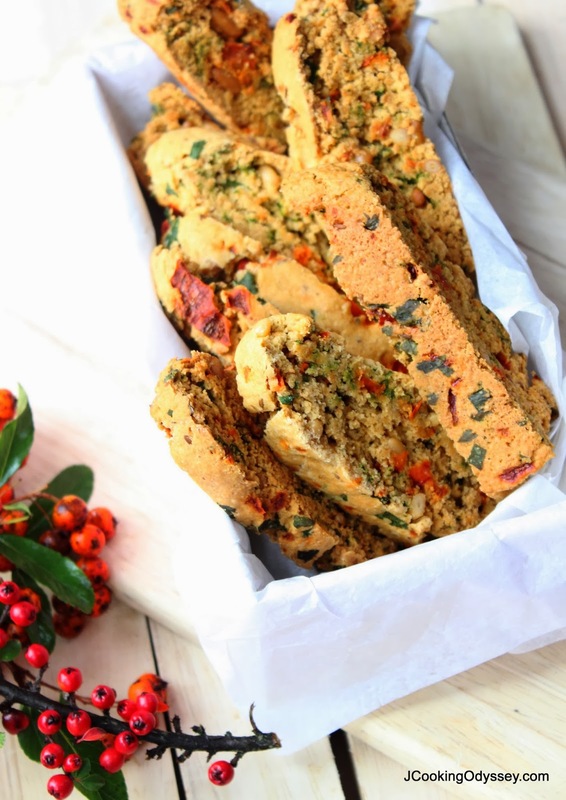 So thought of baking something healthy yet tasty and flavourful - Biscotti..
Biscotti originated from Italy, also known as cantuccini, recipe date back as far as 13th century, infact I saw a recipe somewhere which was created in 18th century and it is eggless. Bis is Italian for twice cotti for cooked/baked, ideal for dipping into dessert wine or coffee. I've eaten very similar baked treat in India, called "toast" in sweet and savoury flavour. 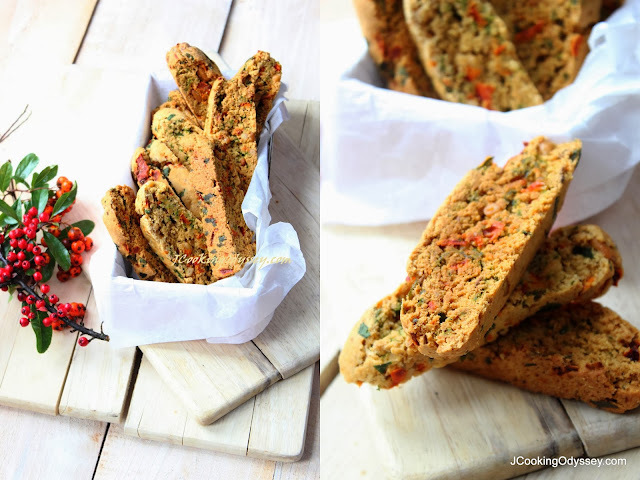 I got inspired by Indian flavour and thought of making Eggless biscotti with pepper, coriander and to make it more healthier I added oats. Delighted with the result, beautifully baked, delicious taste and perfect texture, immensely happy as kids approved the test and asked me when can I bake them again ? Grind oats into flour and leave it aside. Preheat the oven to gas mark 4 or 180C. Line a baking tray with baking paper. Place all the ingredients in a bowl and mix and form a dough. On a lightly surface shape the dough into a log. Transfer it to the baking tray and slightly press the dough. Bake for 35-40 minutes, remove from the tray and leave it to cool on a wire rack for 10-15 minutes until it is cool enough to handle but still malleable. Place on to a chopping board and cut into slices using sharp and serrated knife. Place biscotti slices flat on a baking tray and bake them for 30-35 minutes ( I turned down my gas oven to gas mark 3, half way through I turned them other side, also baked slightly longer as I used oats and whole wheat flour ) I baked for 40 minutes, but was keeping eye on closely. Remove from the oven and leave it to cool completely. Nice and crunchy biscotti ready to eat. 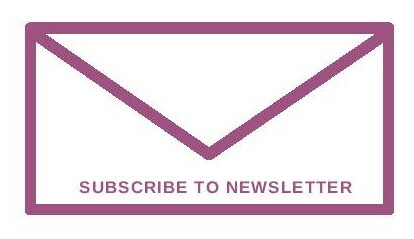 Sending it to made with love mondays ! These are beautifully festive, Jagruti! I love the combination of colors and I'm sure these are very tasty snacks for everyone! 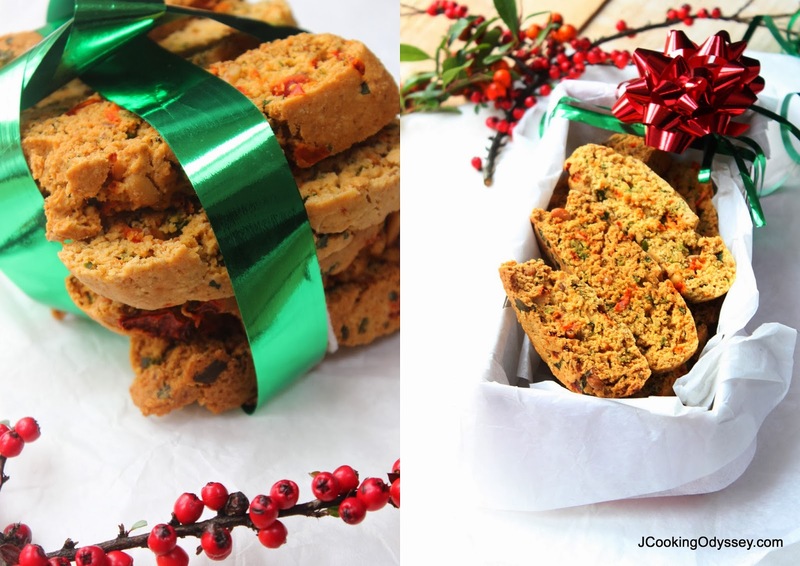 I love biscotti, and these are some really creative flavors!